“Magbigay ng Joy ngayong Pasko,” says the catchy jingle in the video. And what better way to give joy than to give Jollibee Chickenjoy! 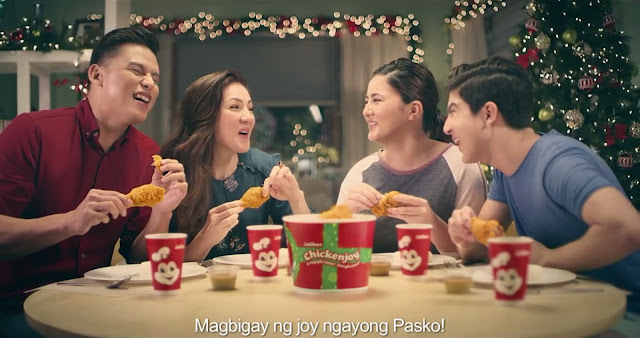 According to a 2017 nationwide survey conducted by the Philippine Survey and Research Center (PSRC), 8 out of 10 Filipinos claim that Chickenjoy is the only fried chicken brand that gives joy to the entire family; and 7 out of 10 Filipinos claim that Chickenjoy is the only fried chicken brand that promotes the joy of family bonding. Indeed, what family could resist bonding over a bucket full of perfectly cooked and seasoned fried chicken that’s crispy on the outside and oh-so juicy on the inside? With an established popularity locally and a growing popularity globally, it’s no wonder Chickenjoy is the favorite of EVERY member of the family. And it shows in the laughter, excitement, and joy that follow every bite. Why do the Legaspis love Chickenjoy? “Iba talaga yung Chickenjoy because it’s crispy on the outside and juicy on the inside,” says Carmina. “Yes, and you can’t have just one, kaya a bucket is perfect for the whole family!” Mavy added. The Legaspis believe that the true joy of Christmas is in celebrating with your loved ones. “We love bonding over a bucket of Chickenjoy, kahit simple dinner lang, masaya na kami,” said Zoren. “Sana more people this Christmas season will experience the joy of Chickenjoy!” said Cassy. You can also bring more joy to your family and friends this season! Jollibee Chickenjoy is available for dine-in, take-out, delivery and drive-thru transactions, with prices starting at Php 360.00* for the 6-pc. bucket, and Php 475.00* for the 8-pc. bucket. For more information on your favorite Jollibee Chickenjoy, like Jollibee Philippines’ Facebook page and follow @Jollibee on Twitter and Instagram.